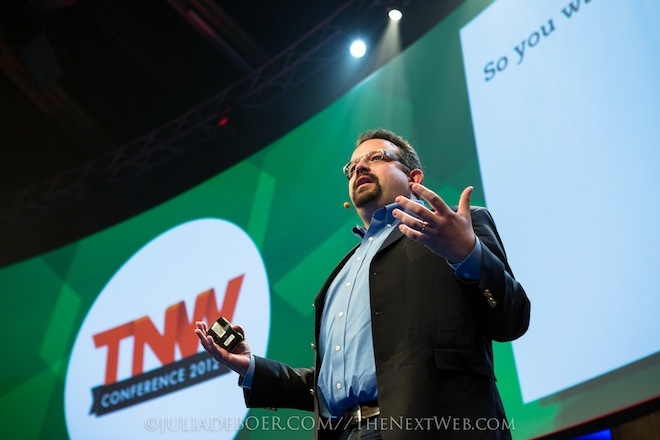 Evernote CEO Phil Libin took the stage at The Next Web Conference earlier today. Libin explained that the first step is for users to actually sign up for Evernote, which people are obviously doing. The second step is to make people stick around longer, which is also happening. Libin said 40 percent of the people that signed up for Evernote 4 years ago (when it started) are still using the service today. The third step is to make people pay for Evernote, which Libin says comes naturally. The company tries to not push people into paying for a premium service, instead giving them value from the get-go and only making it more valuable over time. After 4 years, more than 25% of users pay for the service today. In other news: I had a brief chat with Libin before his talk and asked about the rumored $100 million round at a $1 billion valuation, and it was dismissed swiftly. Libin said they are indeed working on a follow-up financing round, but the negotiations are ongoing and nothing has been closed or decided yet. In other words, Evernote probably will end up raising funding, but how much, when and at what valuation is pretty much unclear even to Evernote management and current shareholders at this point. To be continued, no doubt. Read next: Singapore-based location ad service Chalkboard closes: "Our progress was not meeting our ambition"